YourGolfTravel.com and The Telegraph are honoured to facilitate the Golf4heroes initiative in association with the Battle Back programme. The Battle Back programme is tri-service initative based out of Headley Court which uses sport, among other things in the aftercare of wounded service personnel in order to aid their rehabilitation and return to a more normal active life. The Battle Back golf scheme was set up in 2009 and currently has nearly 60 members. The golfing arm of Battle Back, based at DMRC Headley Court, was set up in 2009 and currently supports over 100 injured service personnel. 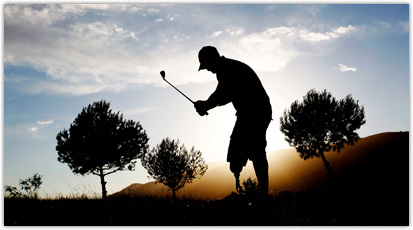 The Golf4Heroes campaign is asking golf courses around the UK and Ireland and worldwide to offer 2 complimentary green fees a week that injured servicemen who are members of the programme can use in between Battle back golf trip and clinics. These roaming rights would be go some way to thank Britain's bravest golfers for the their bravery and sacrifice on behalf of our country. 647 golf courses to go until we reach our target of 1000! The golf4heroes scheme is seeking support from golf courses and resorts from around the country. We ask them to sign up for this initiative to offer complimentary green fees and use of practice facilities to these brave servicemen when they leave Headley Court. Click here to support our Battle Back golfers and become a member of the Golf4Heroes roaming scheme by donating the option of 2 green fees a week to Britain's bravest golfers. Our injured servicemen need our support to keep them on the fairways. Your Golf Travel.com is supporting the Battle Back golfing programme by auctioning 11 great golfing trips for a great cause. Please getting bidding to raise money for these injured servicemen who love their golf! The prizes include a trip to the US Master and a chance to play with real Battle Back golfers.